You’ll find us at shows ranging from Grand Designs to BBC Goodfood, and from Dorset County Fair to the South Yorkshire Game Fair. 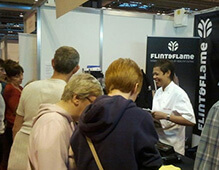 To find out where we are and when, visit our Facebook page which we will be updating with our events on a weekly basis. Why not drop us an email if you’re coming to an event – sometimes we have free tickets from the organisers to give away. You might be lucky! 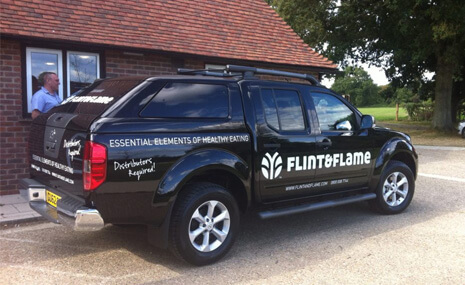 At Flint and Flame we believe that seeing is believing, it is important for you to try something before you buy. And that is why we do the events across the UK, so that you can try for yourself and make sure that the knife feels right for you. You can also experience our renowned quality. Let’s face it, buying something that you will be using on daily basis (in some cases morning, lunch and dinner) is an important decision, and one not to be compromised.